Link below is to a real bearish website, sheesh, more bearish than my view even. On January 22, 2012 we had a "Wake Up Call"
It didn't turn out to be too serious. Picture the sun being 93,000,000 miles away and firing a shotgun blast the size of the earth, towards the earth. Well it is not likely to be a direct hit. Apart from some Satelite disruption, and a few pieces of "space junk" falling out of the sky (indeed the atmosphere changes and causes drag on space junk which then falls out of the sky), some really neat northern lights, and some detectable electric currents in Norway, well it wasn't too bad. But it could be bad. In 1989 a mini-Carrington burnt up some industrial size transformers, and shut down the grid for 6 million people. Serious enough stuff. Just think what would happen if it wasn't just one power company and a few big transformers, what if it was 400 power companies, 5000 transformers, and 400 nuke plants melting down? We have been set up for this, we are living on borrowed time. 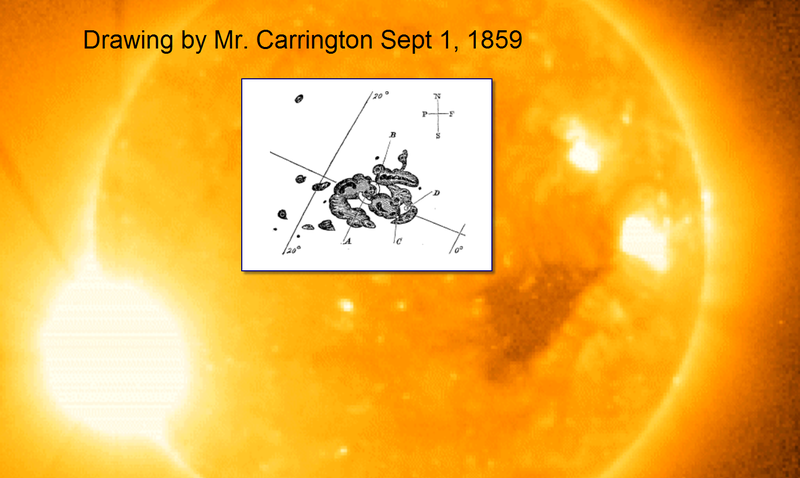 Mr. Carrington was a researcher who observed the sun with a telescope. He noticed a pattern of sunspots /storms never seen before. This created Aurora Borealis throughout the globe, even seen in Cuba. It fried some of the few pipeline and telegraphs in use at the time, the time was 1869. Supposedly, there was a similar event around 1600. I still think this is the best Christmas Gift I have ever received (even if I had to buy it, even if I immediately lent it out). A fantastically good telescope, able to hook up to a camera, and also able to hookup to a computer and be controlled by the computer ...."go to Orion Nebula" and it takes you right there. It has its own GPS so it has a pretty good idea where it is in the world, then you just point it at any three bright sky objects, and it then knows automatically where everything is Exactly. Pick any 3 bright objects and you don't even have to tell it what those objects are. The Scope is only about 60 lbs wet (lets hope it doesn't get wet), but is a beast at gathering light. These are actual pictures. And BTW have you ever looked at the moon, look at the number of big strikes on the moon, in fact it is all crater, crater within craters. So if the Earth is 4B years, and lets say Moon popped up same time, then at a rate of 63 million years for a big strike on a big object like the earth, that would mean a maximum of 65 hits on the moon, and yet there are thousands! Third: we have an opportunity in front of us - the "Smart Grid" project. A lot of the effort in that project is currently going to figuring out how to use load-point control (think controls on your electric water heater, air conditioning, etc. to automatically make everyone a little less comfortable when necessary to avoid brownouts) to serve more people with the system capacity we've got. Any competent system design for Smart Grid has to consider automatically shedding and balancing load when parts of the grid become disconnected from each other due to failures and overloads. It would be easy to extend those requirements just a little further, to provide for automatic disconnection and grounding of transmission lines on command when needed. High levels of security and robustness would be needed - command equipment for deliberately shutting down the nation's grid might be added to the President's nuclear "football". Residence-level Smart Grid comm equipment could similarly disconnect your home from community distribution lines, and (because the Smart Grid assumes there's communication between power plants, grid controls, and your home) could give you a "Civil Defense" - like warning that the shutdown was about to happen, and why. Trowbridge Ford speculates the US, under secret NRO programs, is up all sorts of space weapons use already. Could the current solar storms be resulting from outer-space nuke experiments he describes? ELE has already begun with unstoppable Fuke; perhaps fear, perhaps something else keeps many from looking at the cold hard truth...when the grid goes down, then the whole thing will just speed up...BioAccumulation, mutations, Systems collapse. ; ruined DNA. All carbon-based life forms are threatened...ALL. Thanks, I cant find your youtube channel, please post a link. dc current saturates transformer cores. all you have to do is disconnect the neutral from the ground on long distance transmission lines, and connect a capacitor in series, and a resistor and spark gap. it costs about 50,000 for each of the 1000 biggest transformers. that price includes labor at 100$ an hour, an engineer's stamp, and a lot of bureaucracy. if you disagree with the above, please read the following in its entirety. Can you send the details of the cost estimate, that is only $50M, I was estimating around $2000M. Either way, the price of not hardening these systems could be societal collapse, and country collapse/invasion. No brainer to harden. Actually the price could be extinction, literally.